Nothing kills the excitement of going riding like an unexpected flat tyre, but with the right pump in your workshop or mini-pump in your back pocket you can be back on the bike in no time at all. Bicycle pumps fall into two distinct categories, track pumps sometimes called floor standing pump and mini-pumps, the ones that you can carry with you on a bike ride. Whichever you chose to add to you kit list this winter we've got an amazing selection of high-quality pumps that have the overpriced competition on the run. 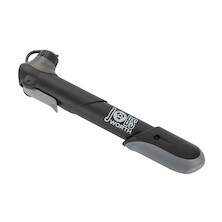 The jobsworth Leveche is a solid, emergency mini-pump. Presta and Schrader valve compatible it comes with a bottle boss mounting kit and can kick out up to 60PSI. It's the perfect emergency bike pump, buy a few and keep them with you wherever you go. The Taku CNC mini-pump is all you'll ever need if you bike rolls on tyres 25mm or larger. Capable of squirting out up to 100PSI, with an all metal construction, Teflon main body lining and tiny form factor it is a serious pump in a seriously compact package. The Jobsworth Levanto is the next step up the mini-pump food chain. This aluminium bodied mini-pump is telescopic, so it can deliver more air with every stroke and achieve higher air pressures, 120PSI max. The T-handle pivots out to offer you more leverage and acts as a knuckle protector so you don't shred your skin on your spokes. It's Presta and Schrader compatible and comes with a bottle boss mounting kit so you can clip it to your frame or carry it in your back pocket. The daddy of the Jobsworth Mini-pump selection is the all-metal Varder. This mini-pump is capable of an incredible 140PSI max air pressure due to its careful combination of precision machined and formed metal parts and a Teflon lined, low friction, metal air barrel. Presta and Schrader compatible the Varder is more than capable of inflating even tubular tyres. It is no toy pump; it's a serious bit of kit that exudes quality from its CNC valve adaptor to its bright polished body. We even designed it so that it can be completely disassembled and serviced by hand. It's the ultimate pocket pump. The Jobsworth Track pump range kicks off with our entry level Boreas. 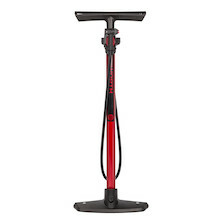 This lightweight, plastic bodied floor standing pump kicks out a remarkable 140PSI and because it uses a higher volume main body than is normal it's the perfect pump for fat tyred adventures. We've designed a 2-way, reversible, Presta and Schrader compatible valve adaptor that's guaranteed not to blow off no matter how hard you pump. It's the pump we love to throw in the back of the van whenever we pack all our mountain bikes up and head to the hills. It's also perfect for home workshop use, for skinny or fat tyres. The jobsworth Hurricane is our least expensive metal bodied floor standing pump. Capable of 160PSI it'll make short work of the toughest track bike tubular tyres or the fattest Fat Bike tyres. With a wide, stable plastic foot married to a steel body and a huge 2.5", top-mounted gauge it's simply the best £20 you can spend on any floor pump. If you're still hanging onto an old, wheezy track pump isn't it time to upgrade? The Vortex, aluminium bodied floor standing pump is the daddy of our analogue pump range. Hand crafted from bright polished aluminium and finished with a solid hardwood T-handle the Vortex looks a million dollars. Capable of serving up 240PSI the Vortex can even double as a shock pump. It's simply the best quality floor pump we know how to make and wouldn't look out of place in any boutique bike workshop. The Vortex has been replacing tired old Silca track pumps everywhere it's been seen, there's no other pump to match it for good looks, proven durability and endless reliability. Digital pumps look like they are set to be the next big thing, there's no beating them for convenience and no more accurate way of ensuring exact tyre pressures. When a couple of PSI makes all the difference between phenomenal tyre grip and second place in adverse conditions then you need the Jobsworth Bayamo. Capable of delivering 200PSi max the Bayamo uses a locking, CNC machined valve adaptor that fits both Presta and Schrader valves. We've even fitted a micro-bleed button onto the valve adaptor so you can trickle out air until you reach your preferred, exact tyre pressure. With a wide, stable cast alloy base and all-metal construction the Bayamo is the high-tech solution to getting tyre pressure right, first time, every time! Last but no means least is the essential suspension pump. Quick and quiet the Ostria is a 300PSI max air pressure capable shock pump, perfect for air forks and rear shocks. It's built to last and small enough to carry with you for those big days out in the hills. With a flexible, articulated inflation hose, Schrader valve adaptor and micro-bleed air port it's the perfect pump for setting up suspension exactly as you want it.